Acadian Genealogy Homepage; Review of "In Search of Our Acadian Roots" CD-ROM in 'Pioneers' Newsletter! The following is a "review" published in July/August issue of "Pioneers", by its author, Marthe Arends. If you are French Canadian or have Acadian ancestors, then you will love the CD-ROM "In Search of Our Acadian Roots"! 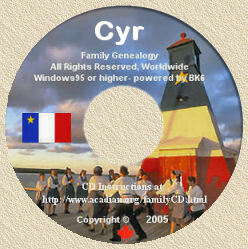 This great CD was based on an even greater idea by Yvon Cyr, who gathered together Acadian GEDCOMs from several sources (134 participants), accumulated informative text files related to Acadians and French Canadians, collected a large shareware software library, included easy to use search software and printed the whole thing up on an affordable CD-ROM. "In Search of Our Acadian Roots" is a non-profit CD, originally intended only for the 134 participants, but now available for anyone with an Acadian or French Canadian interest, and an IBM compatible computer and CD-ROM drive. The CD contains over 500,000 surnames, lots of text files (including Peter Berlo's complete AcadianHistory texts), over 200 genealogy-related shareware files, full names, adresses and phone numbers of the participants, as well as index and match files for the GEDCOMs contained (generated by the included Gensrch software). This CD is a great buy at $49. US or $69. Canadian. Kudos to Yvon Cyr for the creation and production of the project (despite his serious heart problems), and the many other individuals who donates time and energy to create this quality CD. "Pioneers" is published and edited by Marthe Arends, P.O. Box 1531, Lynnwood, WA 980-1531. "pioneers" is published on a not-for-profit basis, with a subscription price of $12. per year (USA) and $16. for Overseas.